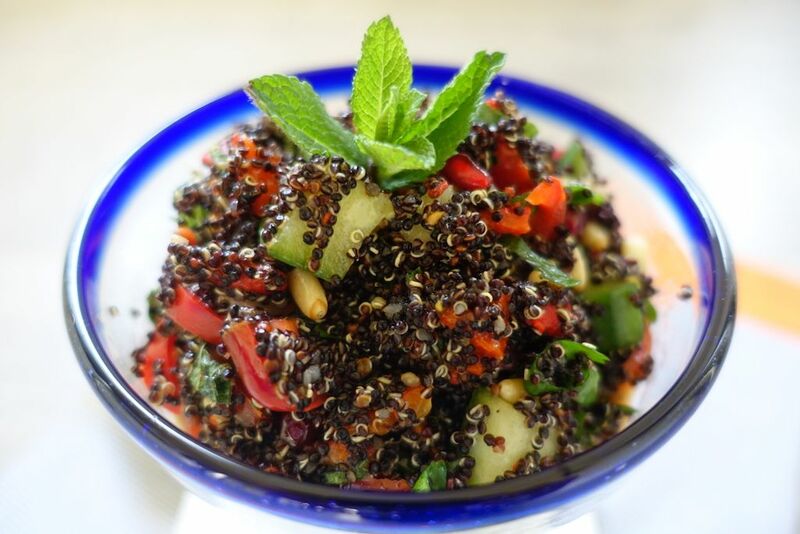 Quinoa is a grain crop original from the South American Andean region, mainly Peru and Bolivia. Quinoa was considered ‘The Queen of Cereals’ by the Incas. It has been an important staple in the Andean cultures since the Inca times. It was also used to treat anxiety and depression due to its high content of magnesium. This gluten free and easy to digest cereal contains omega3, antioxidants, magnesium, high protein level, fibre and many other health benefits. Black quinoa has a harder texture than white quinoa. The flavour is mild so it’s easy to blend with other ingredients. This recipe is fresh because of the orange juice, the cucumber and the herbs, and sweet because of the roasted bell peppers. The tomatoes, orange juice, pomegranate add vitamin C and antioxidants, and the pine nuts and pomegranate add texture, crunchiness and even more flavour. Grill the bell peppers in the oven or on a grill, make sure the skin on all sides is blackened and blistered. Place roasted red bell peppers in a bowl and cover with damp paper towel for about ten minutes. Peel off skin, remove seeds and cores and chop. Rinse cherry tomatoes and cut in four, once lengthwise and in half. Rinse cucumber, cut in half, remove soft the centre and dice. Rinse and cut rings of chilli pepper. 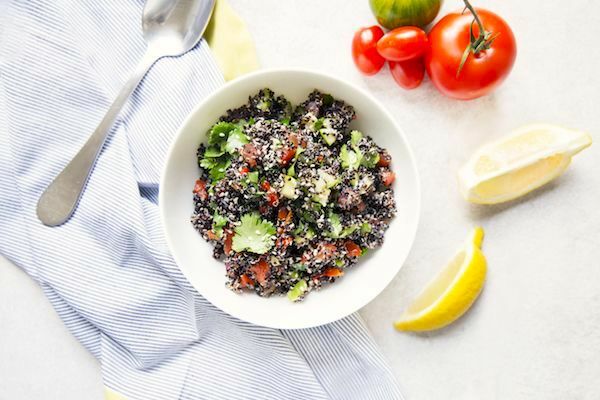 Rinse the black quinoa on a strainer until the water is clear, put in a pot, cover with vegetable stock and bring to a boil. Reduce the heat, cover halfway and cook until you see the rings of the grain detach. Mix all ingredients in a bowl, add olive oil, orange juice, pomegranate, pine nuts, herbs, season to taste, and enjoy. I love to eat it just as a salad for a quick and light lunch however, it can be a beautiful garnish to fish. You can add half an avocado with salt flakes sprinkled on top or mix it with green salad. It keeps well in the fridge for a few days but it’s so good that I don’t think it’ll last long in the fridge. Note: You can use lemon juice instead of orange juice. It will be equally fresh and delicious. Click to view other food posts from my blog. Lovely recipe Solange! The orange juice is just perfect in this salad. Thanks for sharing!